"The Funding Institute" (using the domains thefundinginstitute.org and fundinginstitute.org) is yet another highly questionable site set up by Patchree (Patty) Patchrint and Anthony Christopher Jones of California, who I have covered on this blog several times before (tip: the comments for many of those posts are very interesting if you are doing research). A tip from "Jimmy" in this post reveals a new name for the scheme, simply called "The Funding Institute" and although apparently using the domain thefundinginstitute.org, it is actually hosted on a crappy free website at fundinginstitute.myfreesites.net. to be held in New York, New York on the campus of The State University of New York from July 15-17, 2015. Interested development professionals, researchers, faculty, and graduate students should register as soon as possible, as demand means that seats will fill up quickly. Please forward, post, and distribute this e-mail to your colleagues and listservs. 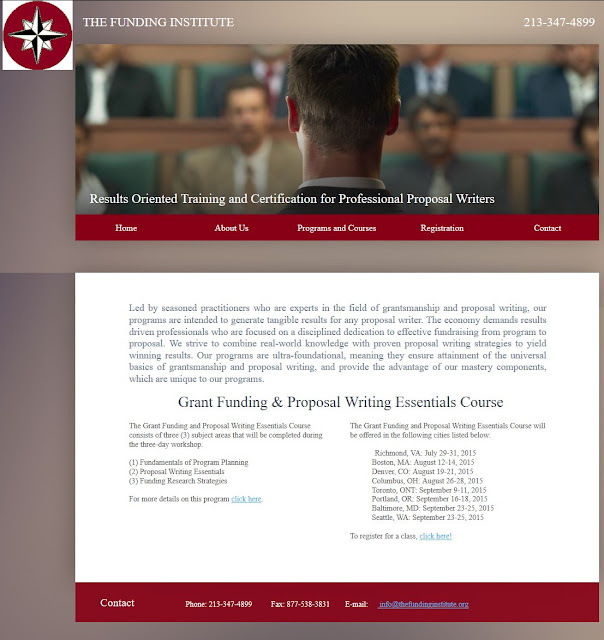 Participants will become competent program planning and proposal writing professionals after successful completion of the Grant Funding and Proposal Writing Essentials Course. In three active and informative days, students will be exposed to the art of successful grant writing practices, and led on a journey that ends with a masterful grant proposal. endeavor. Each student will learn to stop writing the grant and to start writing the story. 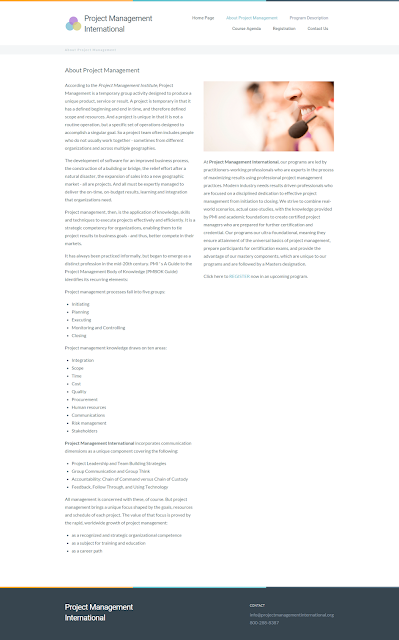 Ultimately, this class will illustrate how each component of the grant proposal represents an opportunity to use proven techniques for generating support. government grant opportunities. Focusing on funding sources and basic social science research, this course teaches students how to use research as part of a strategic grant acquisition effort. is a program next year in your area. To be excluded from next year's announcement, reply to this e-mail and write "Exclude" in the subject line. This indicates that the email really did originate from the owners of ipma11.org (Jones and Patchrint) rather than it being a forgery. 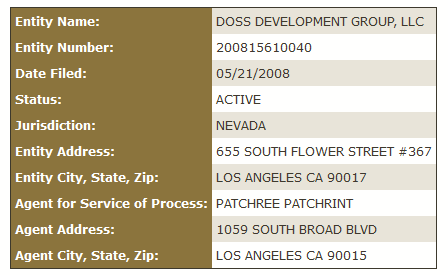 If we go further back in the email headers, we can see another IP address of 173.55.54.221 which (according to DomainTools) is in La Puente, California. 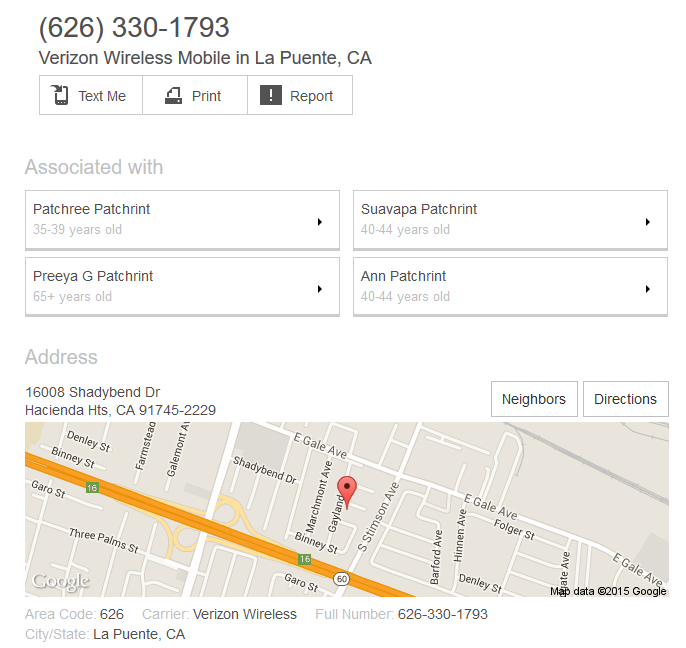 According to WhitePages.com that location is consistent with the Hacienda Heights address of Patchree Patchrint. It link her with a cellphone number of (626) 330-1793 and a potential home address of 16008 Shadybend Dr Hacienda Hts, CA 91745-2229, an address which was previously mentioned in the comments of this post. 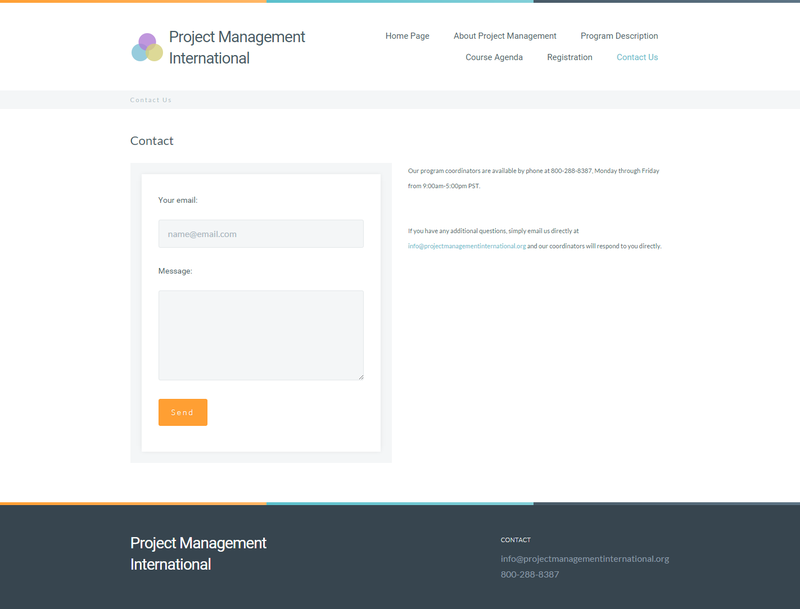 Although their website lists a contact address of "info@thefundinginstitute.org" the underlying HTML tells a different story..
"grantfundingusa" again connects to this post for the scammy "Institute of Project Management America" scheme. The other contact details listed on the site are a telephone number of 213-347-4899 and a fax number of 877-538-3831. As a side note, that fax number also appears on a very similar looking but defunct site using the domain projectmanagementinternational.org (just a forwarder to another crappy free web host at projectmanagementinternational.zohosites.com) which also lists a couple of other contact numbers of 323-813-8387 and 800-288-8387 the latter of which can be seen in this spam which is almost identical to "The Funding Institute" spam. 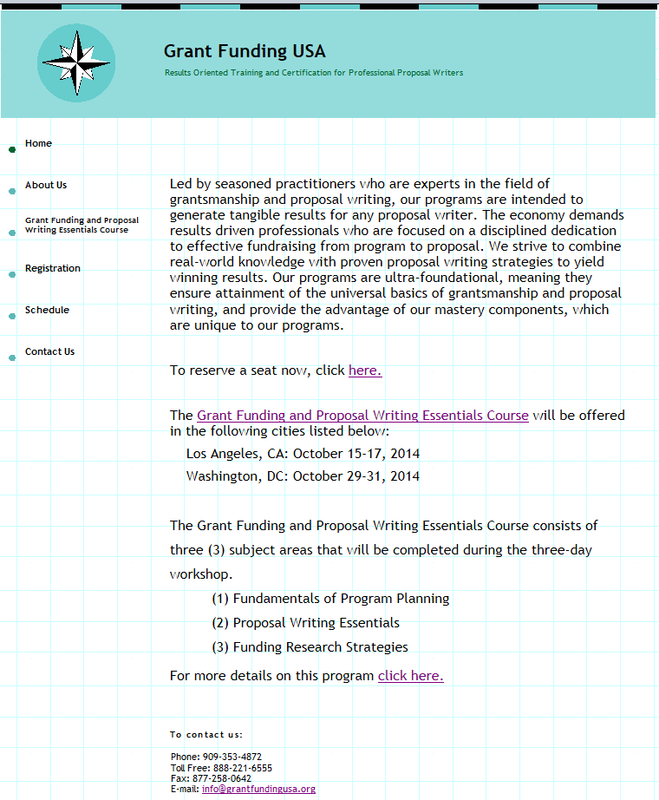 Another point of comparison is the similarity in design elements and wording between "The Funding Institute" and "Grant Funding USA", which uses a similar compass logo and almost exactly the same wording. 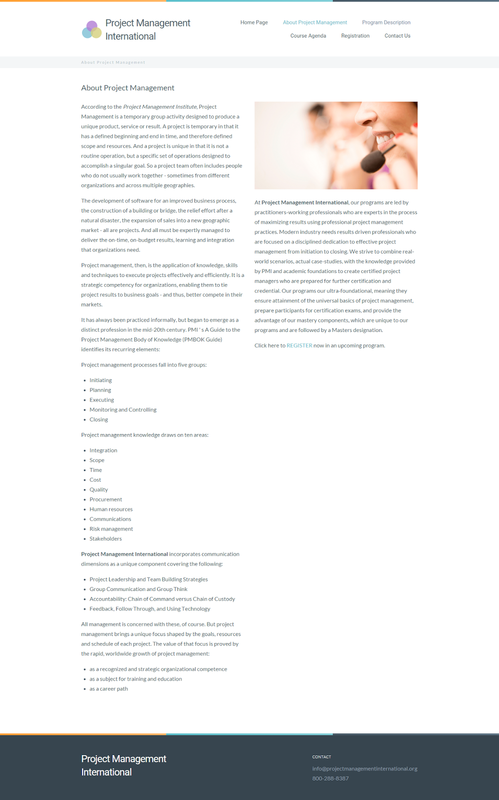 Overall, there are so many similarities between "The Funding Institute" and other schemes run by Jones and Patchrint. The complaints against these two (apart from a string of failed LA restaurants) are of courses that abruptly change locations from prestigious venues to much shabbier ones, of tutors who are recruited at the last minute and are often under-prepared (some of whom claim not to have been paid) leading to low-quality courses, and of course endless spam to promote the ever-changing names of these schemes which have an awful reputation. 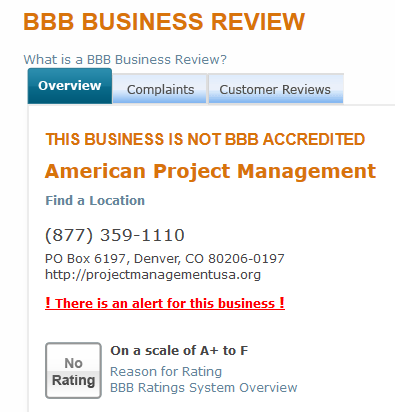 I would not recommend doing business with this pair, and if you think you have been treated unfairly then I suggest you take legal advice or approach law enforcement, the BBB or regulatory authorities. I've been on the case of the individuals spamming for IPMA (and before that NAPPPA) for some time, but it is disappointing to see that they are still pushing their fake seminars such as this one.. 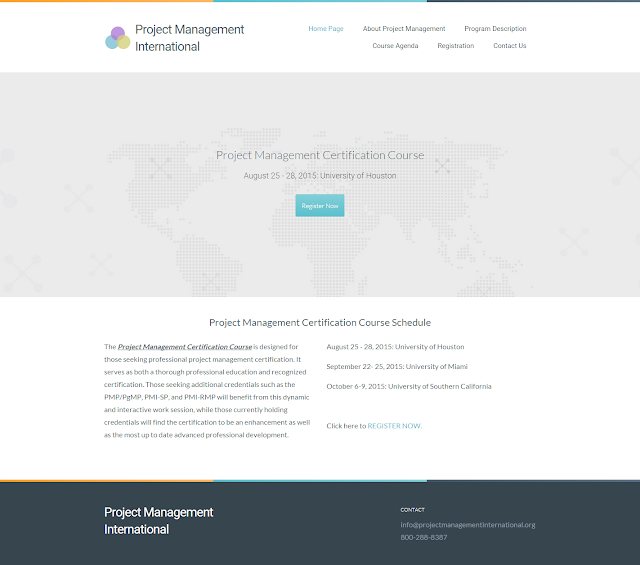 The Project Management Masters Certification Program will be offered October 28-31, 2014 in Portland, Oregon. Project management professionals, business and technology professionals, students, and educators are invited to register at the Institute of Project Management America website here. Participants may reserve a seat online at the Institute of Project Management America website, by calling the Program Office toll-free at (888) 859-5659, or by sending their name and contact information via email the Program Registrar . As the person who helps run the calendar at Seattle Public Library, I can assure you that they do not have space secured here for their "training". They never returned the contract or payment. My personal belief is that this so-called Institute is a complete scam and it should be avoided. If you are tempted by the offer of a course from an organisation called Grant Funding USA with a website grantfundingusa.org then read this first. Grant Funding USA is run by Anthony Christoper Jones and Patchree Patchrint (aka Patty Patchrint or Patty Jones). Previous ventures by this pair include the North American Program Planning and Policy Academy (NAPPPA), Institute of Project Management America (IPMA) (aka DDGLA American Project Management LLC), the Institute for Communication Improvement, LLC, The Grant Institute, and the LA restaurants Mother Road, the Royale on Wilshire and Mode. Established in 2004, Grant Funding USA is a network of independent consultants, nonprofit professionals, and fund raising executives dedicated to sharing their knowledge and expertise in the field of grantsmanship and program development. Our program instructors have over ten years of real world experience in the nonprofit and for profit arena which allows them to effortlessly weave theory and practice into a results oriented program for all participants. The goal of our program is to equip our graduates with the skills and tools they need to succeed in the competitive world of fund raising. 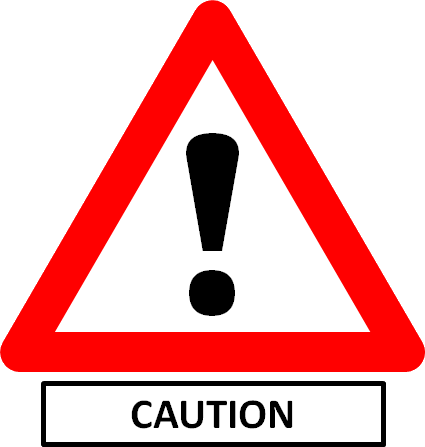 The website was created in March 2014, and certainly this network (of two people, basically) has not been in operation under this name for that long, although there have been warnings about its predecessor called "The Grant Institute" for several years. Before dealing with this company, I urge you to do your own research on the companies that they have run before. Just a quick note to say that if you see an email referring to the site ipma2014.org then this is a new domain for the so-called Institute of Project Management America. Beware. It is NOT related to the 28th IPMA World Congress which uses the domain ipma2014.com or any other legitimate professional organisation. You can read my research on the activities of the people behind this outfit here. 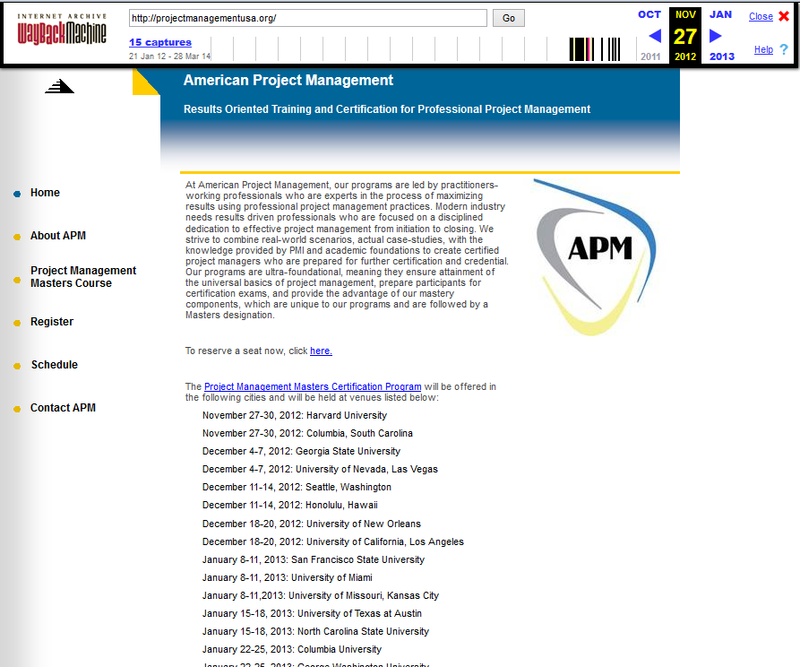 I wrote about the so-called Institute of Project Management America last month along with their principals Anthony Christopher Jones (aka Tony Jones) and Patchree Patchchrint (aka Patty Jones), who have been running what I personally consider to be fake seminars for the best part of a decade. Previous versions of this same outfit were called The Grant Institute and the North American Program Planning and Policy Academy [NAPPPA] (just Google 'em). This spam is advertising a course in Seattle. In my opinion I would give this a very wide berth indeed. 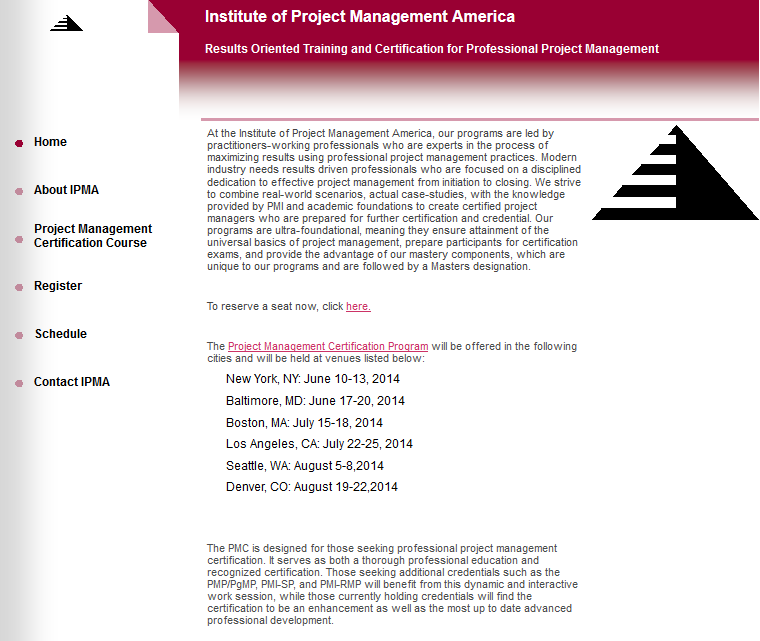 The Project Management Masters Certification Program will be offered August 5-8, 2014 in Seattle, Washington. 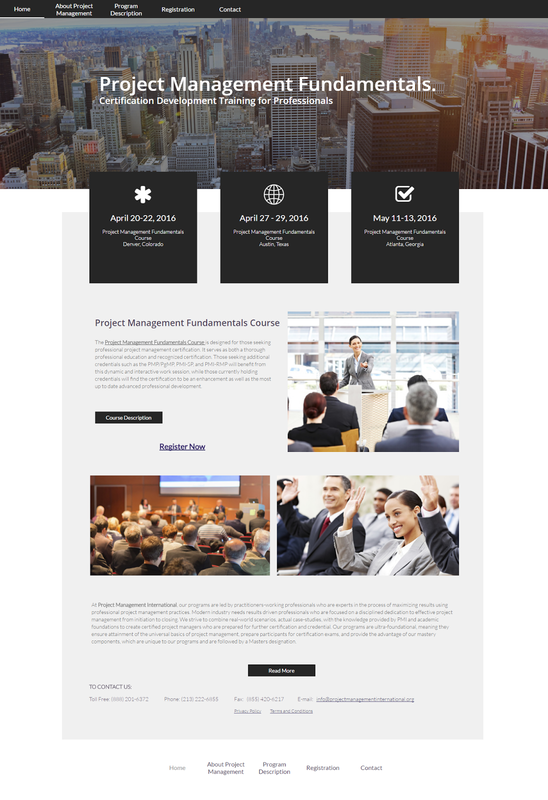 Project management professionals, business and technology professionals, students, and educators are invited to register online at the Institute of Project Management America website. Participants may reserve a seat online at the Institute of Project Management America website, by calling the Program Office toll-free at (888) 859-5659, or by sending their name and contact information via email to the Program Registrar . Upon receiving your registration, a confirmation email is sent to registrants that includes session site information, travel information, program description, and details on how to confirm attendance and make payment arrangements. Click Here to be removed from this mailing list. 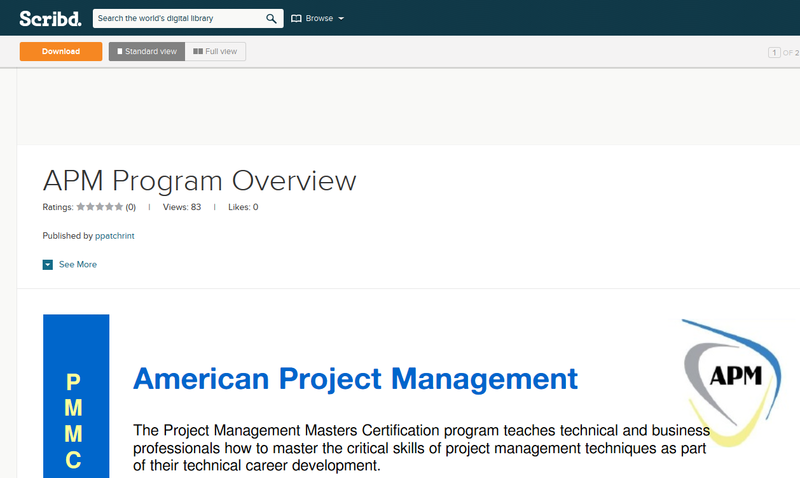 I advise you to research the so-called Institute of Project Management America (along with The Grant Institute and the North American Program Planning and Policy Academy [NAPPPA) yourself. In particular, I would personally recommend not booking a course with them, and not accepting a job offer as a trainer. NOTE: You can find out who was operating NAPPPA here. Earlier this year, I came across a fake seminar outfit called the North American Program Planning and Policy Academy (NAPPPA) [read the comments for more information] running out of a rented mailbox in Los Angeles. NAPPPA was recently covered by ABC15 in Arizona (see video below). It seems to be a bait-and-switch operation. Seminars are promoted as being held at universities, only to switch venues at the last moment, students complain the the seminars are of very low quality and there are complaints as well that people who have been employed to teach these seminars (often hired via Craigslist) are not getting paid. NA3PA will be conducting the Program Planning, Evaluation, and Proposals Strategy Session in Los Angeles, California on October 18 - 19, 2011. Interested development professionals, researchers, faculty, and graduate students should register as soon as possible, as demand means that seats will fill up quickly. Please forward, post, and distribute this e-mail to your colleagues and listservs. 1. Participants tentatively reserve a seat online at http://www.na3pa.org, by calling the Program Office toll-free at (888) 673-8865, or by sending their name and contact information via email to registrar@na3pa.org. 3.Upon attendance confirmation, registrants will receive (usually via email) a Pre-Session packet that will include 1) a Pre-Session Interview, 2) Pre- Session exercises to be completed, 5) a Session Agenda and Schedule, and 4) a receipt. You have received this invitation due to specific educational affiliation. We respect your privacy and want to ensure that interested parties are made aware of NA3PA strategy sessions and schedules. This is intended to be a one-time announcement. 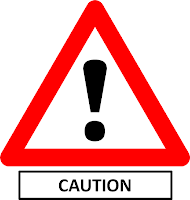 In any event, you should not receive any more announcements unless there is a program next year in your area. To be unlisted from next year's announcement, send an email to remove@na3pa.org and write "Unlist" in the subject line. na3pa.org itself is hosted on 69.72.186.55 at Fortress ITX. 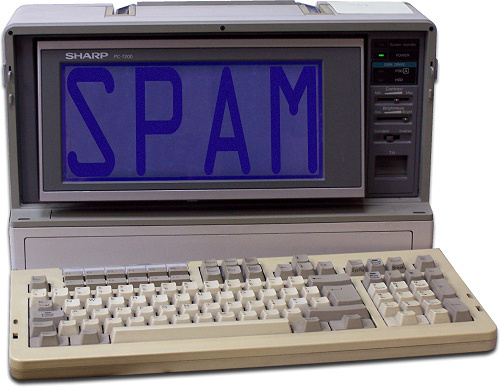 If you get a spam from NA3PA (and you can be assured that it is a spam), then forward it to abuse -at- fortressitx.com. That server also hosts napppanet2.org which has been used before, and similarly has an anonymous registration. 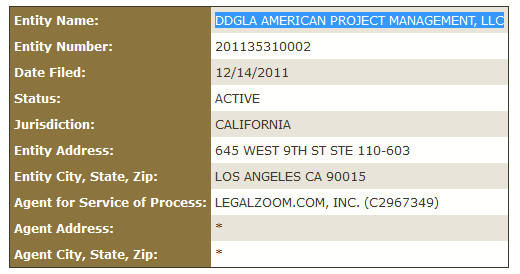 The email is sent from an apparantly address of losangeles@grantfundraising.org - grantfundraising.org is another recently registered anonymised domain. 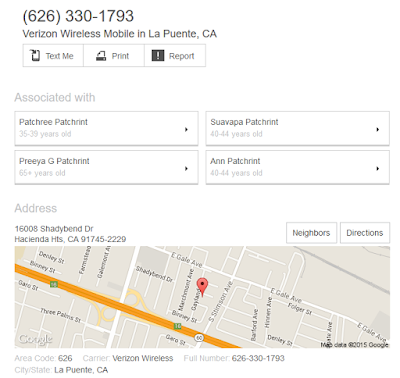 This operation appears to be run out of California, apparently from the Hacienda Heights area (the originating IP for the emails is always 173.55.115.38). I know that complaints have been filed with both the BBB and the California AG's office, but no action appears to have been taken. If you have any experience of "NA3PA" please feel free to share them in the comments.